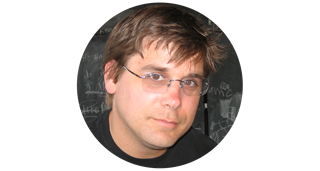 Michael Cohen has written a full-featured NPM package for QuickBooks Online integration called node-quickbooks. Nodejs is merging with Iojs and will continue its march as a formidable tech stack. What's great about Node is its robust NPM ecosystem. Since Node is relatively new the NPM packages are fresh and generally constructed with modern best practices. In the case of node-quickbooks it has full support for JSON, which Intuit has blessed as its primary data format for API version 3. This is something of a challenge for other libraries such as quickbooks-ruby and quickbooks-php, which are primary XML based. With all of those bonus points, let's investigate getting up and running with some basic integration. Clone either your fork or the main repo, switch into it, and make sure to run npm install in both the root and in the example directory. All of the integration code is in index.js. We are mostly going to be working within the example directory. While still in the example directory fire up the example app. You can simply node app.js but do yourself a favor and use nodemon instead. Right above that code are variables for CONSUMER_KEY and CONSUMER_SECRET. 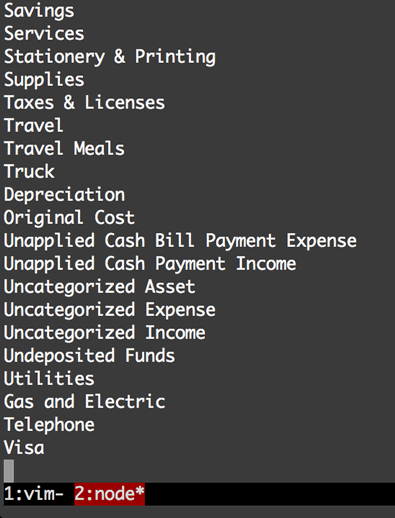 These values are from an "Intuit app". 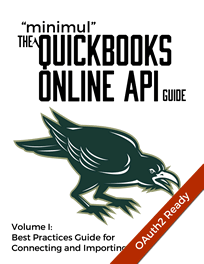 You must make an QuickBooks app with Intuit if you want to integrate with the Online API. 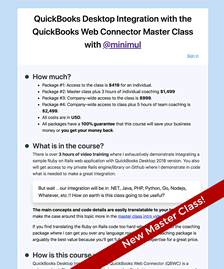 Goto https://developer.intuit.com, sign up, and login. Once logged in hit the "Create a new app" button. Follow the steps and then grab the consumer key and secret. Click on the "Keys" tab to reveal the consumer key and secret. Also open update views/index.ejs and turn off the payments API if you didn't enable it when you created the Intuit QuickBooks app. 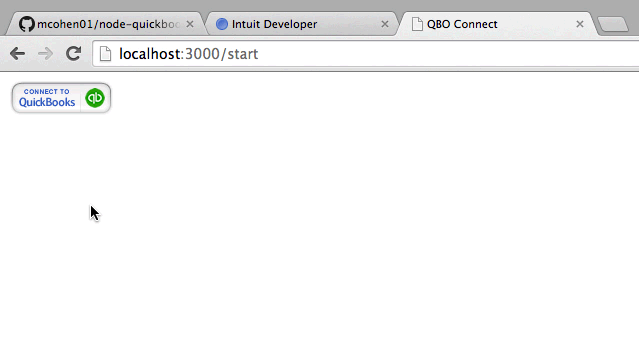 Go back to http://localhost:3000/start and click on "Connect to QuickBooks". Finish the the 3-legged OAuth. If you are prompted for a username and password supply your Intuit developer credentials created earlier. 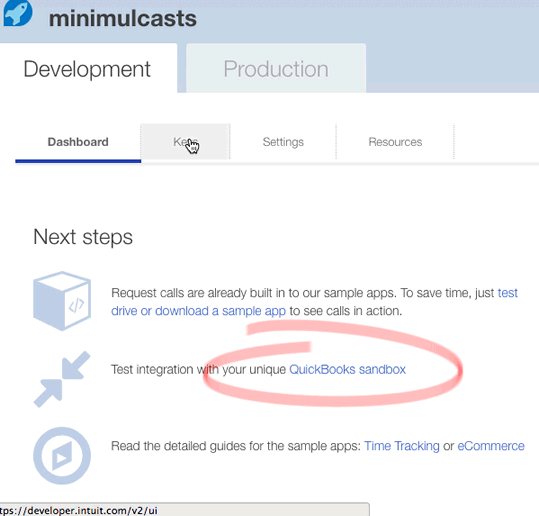 When you create an Intuit QuickBooks app you will automatically have a sandboxed QuickBooks Online client app created for your developer account, therefore, this is what you are going to be connecting to with the "Connect to QuickBooks" button. Click here to access your developer sandbox. After OAuth you will be returned the /start page. Go back to the console where you are running the nodemon app.js you should see the following output. This output is the dev sandbox chart of account names. You can see from app.js starting at line 78 what the actually find code is. That'll do it for part 1. In part 2 I will expand briefly on this by creating a customer route that will look up and output the QuickBooks Online customer "DisplayName". Also, reference the code for this 2-part tutorial.